With the majority of my posts I attempt to tie the recipe in with a holiday, significant event, the seasons, a poignant moment, etc.. I try to tell a nice little story while weaving in the recipe. No real story here. Just scrumptious cupcakes. And maybe that is the story. 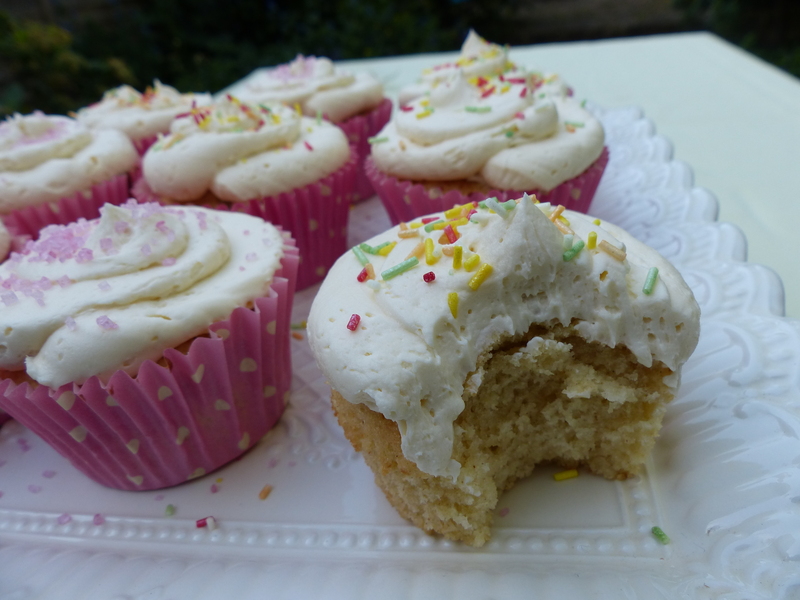 I’ve been making these plain vanilla cupcakes with buttercream frosting for years and they are still our family’s favorite baked treat. The cake is a spongy vanilla and it makes a lot – two dozen to be exact. Plenty for the ever-popular British school cake sale or a birthday party, but also plenty to randomly bake on a Wednesday after school when all my girls want to do is bake even though it’s a gorgeous spring day outside, so we bake, and now have 24 cupcakes which we will easily gobble down on our own faster than is decently acceptable so we distribute them to friends and neighbors (and yes, set aside a few for a friend’s birthday this weekend). Then there’s the buttercream. Creamy, rich and decadent, this should become your go-to frosting recipe to replace all others. No double boiler, adding butter one piece at a time, or candy thermometer are necessary. Just beat your butter, sugar, vanilla and cream in a mixing bowl til it’s fluffy. The perfect Wednesday afternoon cupcake. And if the thought of eating a delicious vanilla cupcake piped with buttercream isn’t enough to get you baking, then the big smiles and showering of appreciation from the happy recipients in return for a random – and delicious – act of kindness, is totally worth it. Note: This recipe also makes two 8″ round cakes or one 9″x13″ rectangular cake. Just bake for a bit longer. If you don’t have cake flour substitute with 2 2/3 cups plain, all-purpose flour and 1/3 cup corn starch. For colored frosting, add food coloring during the last minute of beating. Cupcakes can be stored, unfrosted, in an air-tight container at room temperature for up to three days or frozen in a zipper-lock freezer bags for up to three weeks. Defrost at room temperature before frosting. Frosting can be made up to two days ahead and refrigerated in an air-tight container. Before using, let stand at room temperature to soften for about 1 hour, then beat for about two minutes with an electric mixer. Preheat the oven to 325º F (160º C). Line a (2) 12-cup muffin tins with paper liners. Whisk the flour, baking powder, salt and baking soda together in a medium bowl and set aside. 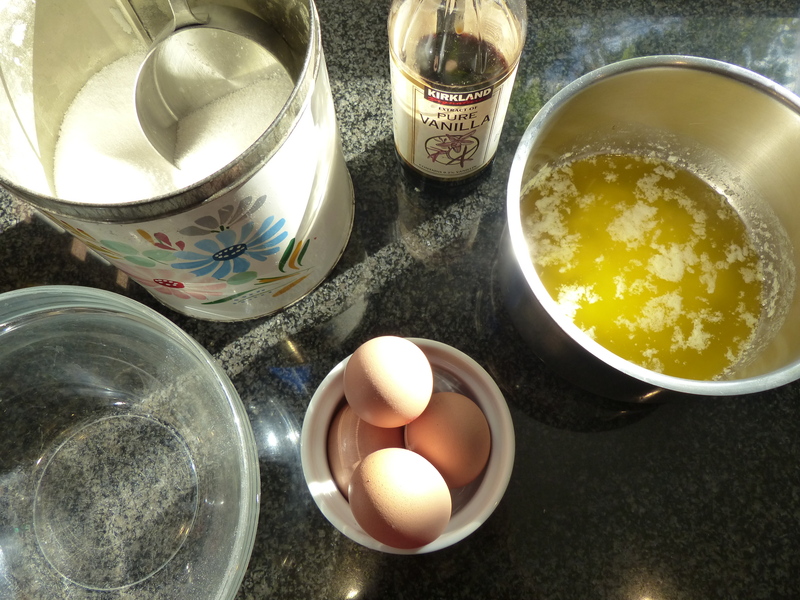 Whisk the eggs and vanilla together in a large bowl. Slowly whisk in the sugar until combined. Whisk in the melted butter in three additions until completely combined. Whisk in the buttermilk. 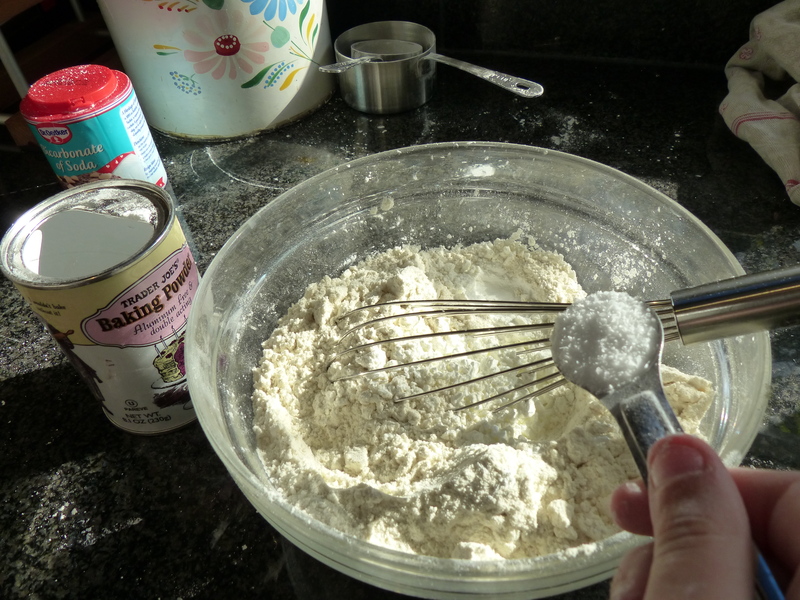 Add one-third of the flour mixture to the batter and whisk it in (a few streaks of flour should remain). Repeat twice with the remaining flour mixture and continue to whisk the batter gently until most lumps are gone. Do not overmix. Let the cupcakes cool in the pans on wire racks for 5 minutes. Remove from the pans and let cool completely before frosting, about 1 hour. For the buttercream frosting: In the bowl of an electric mixer fitted with a paddle attachment, beat the butter on medium-high speed until smooth, about 1 minute. Reduce speed to low, slowly add the powdered (icing) sugar, and beat until smooth, about 3 minutes. Meanwhile, in a small bowl stir the milk, vanilla and salt together until the salt dissolves. 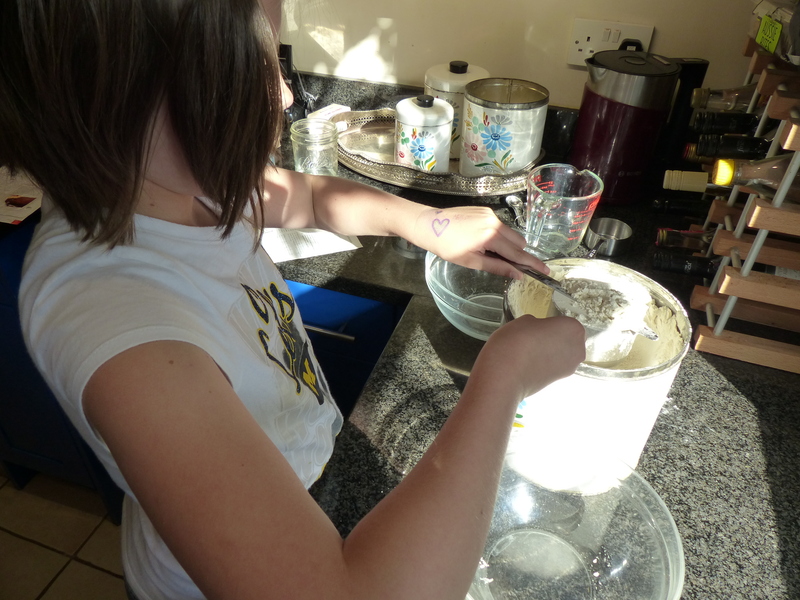 Using a spatula, scrape down the sides of the mixing bowl. Add in the cream mixture, increase speed to medium-high and beat until the mixture is light and fluffy, about 5 minutes. If coloring frosting, add during the last minute of beating. To frost cupcakes, place a large piping tip into a pastry bag and fill bag with frosting. (If you don’t have a pastry bag and tips, fill a large zipper-lock bag with frosting and cut off the corner.) Starting on the outside of the cupcake, move pastry bag in a clockwise motion working inward, finishing in the middle and leaving a slight peak.